In his regular column, BBC environment analyst Roger Harrabin asks how the UN's climate change body may be changed by revelations of purported errors in its key report. The hue and cry for the head of the Intergovernmental Panel on Climate Change (IPCC) Rajendra Pachauri is in full spate, and he is defiantly refusing to apologise personally for the Glaciergate bungle. But we should pause for a moment to ask if this particular manhunt will produce a better system of climate science. Dr Pachauri heads an organisation set up to advise governments on the latest knowledge of climate science, potential impacts, and economic and social solutions. The task is split into three working groups. Is it realistic to assume that the overall chair will check the reference footnotes in all three sections of a 3,000-page report? I think not. The Glaciergate mistake (important not because it was made, but because it was not spotted) was the responsibility of Working Group II (WGII). As I mentioned in a recent column, the same working group also failed to reference fears over the Amazon rainforest properly, even though the science itself was solid. The co-chairs who oversaw WGII have served their term. They were the British scientist Professor Martin Parry and Argentinian meteorologist Dr Osvaldo Canziani. But the question we need to ask is how the IPCC can be reformed in a way that doesn't make it worse. Some critics want the IPCC abolished altogether, but without a mutually-accepted source of information it is inconceivable that nations of the world will be able to agree a joint resolve to cut emissions (this is exactly the outcome that fossil fuel lobbyists in the US have sought). China is demanding that future IPCC reports contain "sceptical" points of view, which will go some way to satisfying complaints from sceptics that their views are brushed under the carpet in the name of consensus. It will be hard to resist this demand; but if granted, it will place more onus on the main authors of the report to draw up a synthesis of opinions and explain why they favour one over another. There is an argument for creating full-time posts of the role of working group chair - currently a spare time job. There is also an argument for a core of inter-governmental experts sitting in the same place, filtering information together, asking for further research in certain areas. But libertarians will see this as consolidating power in the hands of the few, which will lead to huge rows over who should be appointed to this "Climate Supreme Court". Then there is the question of what to do about so-called "grey literature" - evidence that has not gone through a scientific peer-review process, like the WWF claim over glaciers. I was shocked to see WWF "science" included in the IPCC report, but several scientists have since said that it's essential to spread the search for climate facts beyond the narrow realms of peer-reviewed journals. They point out that the IPCC set out to be inclusive, allowing input from firms, pressure groups and ordinary people. Indeed on the BBC World Service programme World Have Your Say this week, Indian campaigner Vandana Shiva argued for more emphasis on "people's science" - the knowledge of farmers passed from generation to generation of when the rains should come. This is a different form of knowledge, she says, but cannot be written off just because it has not been written up. The question of timing is another vital one to be addressed. Currently, the IPCC reports every four to five years. But the science is changing all the time, and negotiations over emissions are ongoing. What's more it can take two to three years from a scientific paper first being written to having it published and approved by the IPCC. That can lead to a massive delay. How the IPCC tackles this is one of the most difficult questions. Finally (for now - because there will be other issues) there is the matter of openness. I do not think that the IPCC will be allowed to publish again without greater transparency - that means better labelling of categories of "grey" material, and scrutiny from the worldwide web. The web is the home of right-wing bloggers who campaign politically against the IPCC. But, for all its frequent vitriol and false accusations, the blogosphere has been proven at least partially right on occasions. Any future iteration of the IPCC will have to find a way of taking the serious bloggers seriously. A final few thoughts on Dr Pachauri. I note that he is being mocked in some newspapers for "not even being a scientist". Dr Pachauri is indeed an economist. He was appointed after the Bush administration staged a coup to oust the previous IPCC chair - a scientist who was making too much noise about climate change. The Americans thought Pachauri would promote a development-centred economist's view and soft-pedal on the science. He did for a while, but then became exasperated by politicians' sluggishness on cutting emissions. After years of being hounded by sceptics he is now snarling defiance like an animal at bay. 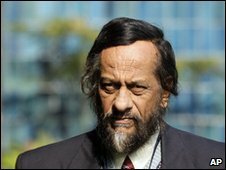 However, Dr Pachauri rashly dismissed initial allegations over Glaciergate. He might be undone by allegations over an alleged conflict of interest between his research institute and his IPCC role - a conflict he denies. And there are many, including some environmentalists, who think he should go. But whoever takes over his IPCC role will have a mighty job on their hands. Harrabin's Notes: A bleak forecast?